There was a rare golden moment for Greece as Aggelos Vasileiou won a thrilling dash to the line on the final day of the UIPM 2018 World Biathle/Triathle Championships in Sahl Hasheesh, Egypt. Vasileiou (GRE), who previously won gold in the 2015 championships in Batumi (GEO), prevailed by 1.77secs in the senior category of the Men’s Individual Biathle, denying the top prize to previous champion Tomas Svoboda of the Czech Republic. They were joined on the podium by Temirlan Temirov of Kazakhstan. Lena Gottwald of Germany won the Women’s Individual gold, with Lushano Adendorff Smit of South Africa claiming silver and the bronze medal going to Eliska Pribylova (CZE), who finished the week with a medal from all four days of the championships. In the junior men’s category, Kazakhstan performed strongly with three of the top four places. Arman Kydyrtayev (KAZ) won gold and Meirlan Iskakov (KAZ) took the bronze, split by silver medallist Dylan Kruger (RSA). South Africa went one better in the women’s juniors as Tara Schwulst (RSA) prevailed ahead of Karolina Krenkova (CZE), with a popular bronze medal for Egypt’s Noureen Elgamal. There was more joy for the host nation at Under 19 level as Ahmed Hefny (EGY), a silver medallist in Triathle the day before, went one better to top the podium. 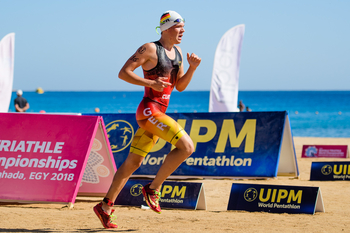 Visit the UIPM website for all results from the 2018 World Biathle/Triathle Championships.